Ferrari locked out the third row in the qualifying for the Malaysian GP. The fabled Italian team could not fulfil its expectations as it intended to be the nearest challenger to Mercedes. However, both its drivers are hopeful that the race pace turns out to be better to the one of its current arch rival Red Bull. Ferrari tried out a series of aerodynamical upgrades during Friday running to lift its performance in the fierce battle for the second place in the Constructors’ Championship. The Maranello-based team showed promising pace on Friday with decent long runs, but it failed to beat Red Bull in the heat of the Malaysian qualifying session. Kimi Räikkönen ended up sixth after having made a mistake on his last lap. The Finn has been having the upper hand on his team-mate Sebastian Vettel up to that point of the weekend. “It was a pretty smooth running until the last try: then I had some traffic on the out lap and struggled with the tires to make them work in the first two corners, so I ran a bit wide. 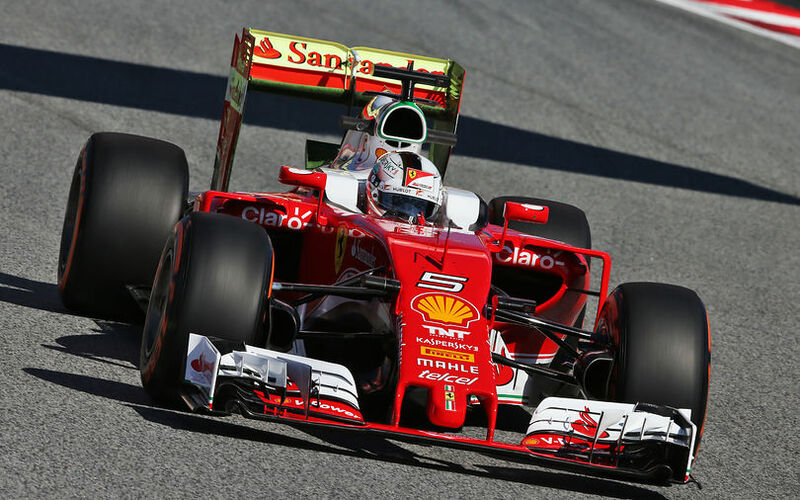 It was a decent qualifying session but it’s painful when you have such a bad last try,” said Räikkönen. The 2007-champion was delighted with the handling of his car after suffering from some balance issues of Friday. “The handling of the car has been pretty ok and I was hoping for a bit more, but tomorrow we’ll try to do better.We don’t know what will happen and obviously we are not in the ideal starting position. The tarmac is new so it’s hard to say where it’s going to go and which tire will be the best, it will be a lot down to the conditions. We have to do our own best and see what that brings in the race,” concluded the Finn. Sebastian Vettel could not hide his disappointment after the all-important session as he expected his team to conquer the second row. Vettel hopes for some unexpected factors to make appearance in the race and he also thinks that the compulsory use of the harder tyre can spice up the strategy. “There is a bit of room for manoeuvre, as everybody has to use the harder tire, which might make it interesting. And then there is also the fact that we are in Malaysia, so there might be some rain, or just the heat as a factor,” added the quadruple champion.